Although entry level PC notebooks will still ship with a 1366 x 768 panel, the high end of the market is quickly shifting to 1080p and higher resolution panels. Some of the most interesting notebooks at Computex launched with high DPI panels, such as the new Acer Aspire S7 and the ASUS Zenbook Infinity - both with 13.3" 2560 x 1440 displays. These displays offer comparable pixel density to Apple's MacBook Pro with Retina Display. 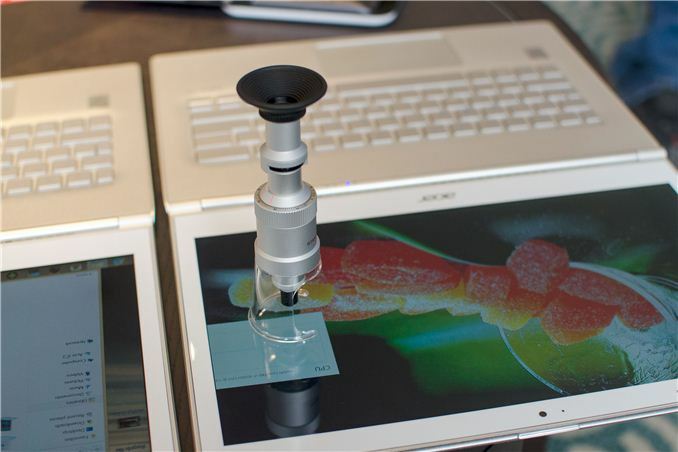 Intel had one of the 2560 x 1440 Aspire S7s at their Computex suite as well as a microscope for showing off the difference in pixel size. With a 33% increase in pixel density, the 2560 x 1440 panel obviously has smaller pixels. There's nothing new about increasing pixel density, however OS support/integration is just as important to the overall experience as physically outfitting notebooks with high DPI panels. Windows has traditionally done a terrible job of DPI scaling on the desktop, but word around Computex is that this should be fixed with Windows 8.1. Apple does not ship any laptops that cost more (by default) than their retina equivalents. There are still trade-offs to high resolution displays, cost being one of them (power being the other). 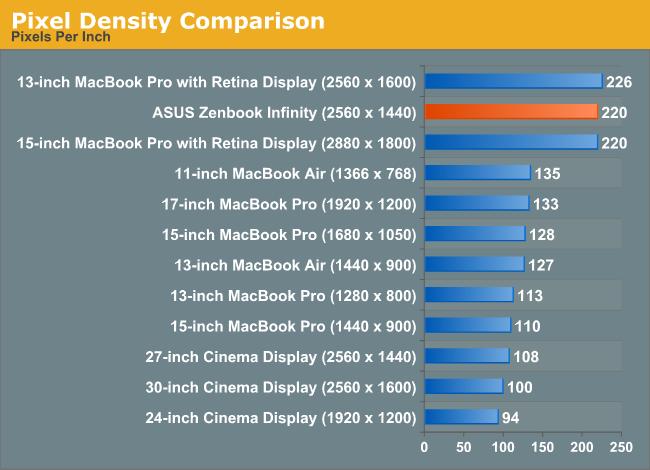 I suspect Apple will migrate all their notebooks to high DPI displays when they can (as costs go down and power efficiency goes up), but Haswell is the first generation that makes a high DPI ultrabook (or mac air) feasible. It's not a simple problem to solve; if you standardize on real-world measurements ("this dialog box is 3 inches wide"), then something that works well on a 27" screen will be a horrible experience on a 11" screen. A better solution may be to decouple render resolution and display resolution entirely. Instead of varying the display resolution, vary the render resolution. So if your display is 2560x1440, your backbuffer that you render to might be anything from 2560x1440 to 5120x2880, but a dialog box might always be 200 pixels wide. By varying the resolution of the backbuffer, you can change the size of the dialog box on-screen without losing detail (because you're always downscaling for display).